A post for the Feast of the Holy Angels, by Penny. 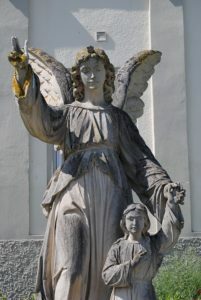 Of all the misconceptions that I usually encounter, however, the most common revolve around angels: the belief that humans who “cross over” turn into angels, for example, or that that angels are “beings of light” who can “channel” that light through you if you meditate enough and burn the right kind of candle. The reality, though, is a lot more fascinating than these insipid New Age ideas. While I was in the convent, I read through a fair chunk of the Scriptures, and noticed a pattern whenever God sends an angel to speak with a prophet: the prophet looks up, sees something enormous that burns brighter than fire, and immediately keels over unconscious. Far from being benign lights with a fondness for lavender oil, the angels in God’s service are the highest created beings, reflecting the glory of God with a brilliance that drives humans to the ground. They are also warriors who will, at the end of time, fight the final battle with the devil and drive him and his followers into hell for eternity. Consider the Archangel Gabriel, who is most well-known, of course, for bringing the joyful message of the Annunciation to the Blessed Virgin. 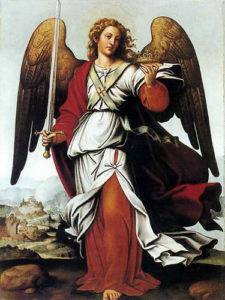 This isn’t his first appearance in the Scriptures, however: hundreds of years earlier, Gabriel had appeared to the Prophet Daniel and – after waking Daniel from his faint – described to him an angelic war that was in progress at the time, in which he was fighting side-by-side with Michael (Daniel 10:12-13.) To me, this image of Gabriel in battle makes the Annunciation even more profound: the powerful warrior brings God’s message to a young woman from Nazareth, and quietly awaits her answer. But he said unto them, “Fear not, for it shall go well with you; praise God therefore. 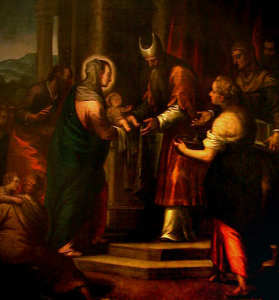 Of all the books of the Old Testament, Tobit is the one I most love to re-read: a story of ordinary people to whom God sends an angel as a teacher and protector, not for any grand world-changing reason, but for the simple purpose of bringing them joy. We too, can turn to the angels in prayer and ask for their guidance in discerning the will of God – and we, too, can ask these heavenly warriors for their protection. 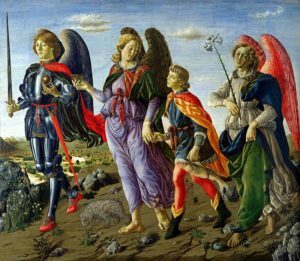 I’ll conclude with a prayer to Saint Raphael, “The Angel of Happy Meetings,” which took on a new and powerful meaning for me after I left the religious life. At a time when I was struggling to imagine that I would ever find a place to belong, this prayer reminded me that, somewhere in the world, there are people who don’t yet know me but are waiting for me nonetheless. This is the essence of any vocation: God has created something that will be incomplete until you are part of it. On this Feast of the Holy Angels, let us ask their help in finding it. O Raphael, lead us towards those we are waiting for and those who are waiting for us. May all our movements, all their movements, be guided by thy light and transfigured by thy joy. Lonely and weary, deeply grieved by the separations and sorrows of earth, we feel the need of calling to you and of pleading for the protection of thy wings, so that we may not be as strangers in the province of joy. Remember the weak, thou who art strong, whose home lies beyond the region of thunder, in a land that is always peaceful, always serene and bright with the resplendent glory of God. 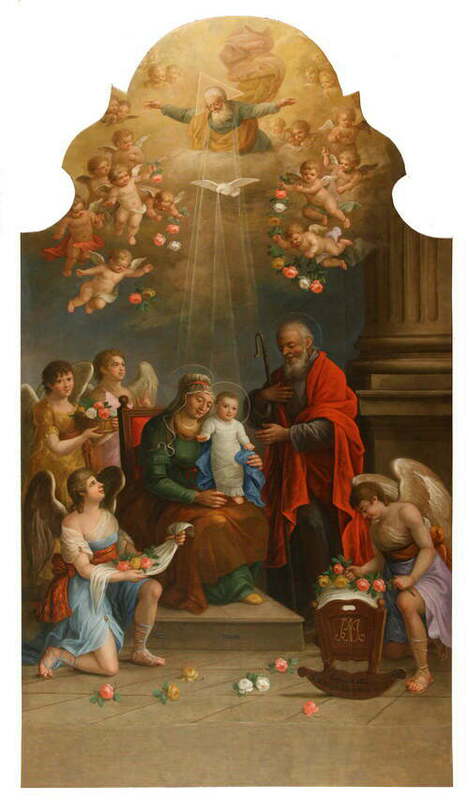 Lord God, the day of our salvation dawned when the Blessed Virgin gave birth to Your Son. As we celebrate her nativity, grant us Your grace and Your peace. We make our prayer through our Lord Jesus Christ. Amen. 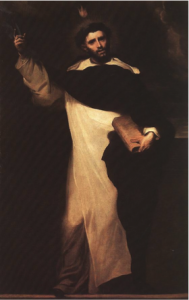 Spanish priest and founder of the Dominican Order. An excerpt from The Lives of the Brethren of the Order of Preachers, compiled by Blessed Humbert de Romans, AD1277. 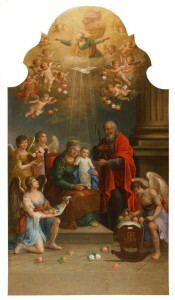 Suddenly he was rapt in spirit before God and saw Our Lord and the Blessed Virgin sitting at His right. It seemed to Blessed Dominic that Our Lady was wearing a cape of bright blue, the color of sapphire. As Blessed Dominic looked around, he could see religious of all the orders but his own around the throne of God, so that he began to weep bitterly and stood far away, not daring to approach the Lord and His mother. 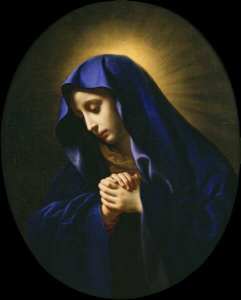 Then Our Lady motioned for him to come near. But he would not dare, until Our Lord Himself also called him. Then Blessed Dominic cast himself before them weeping bitterly. 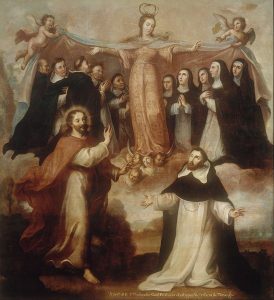 Then the Blessed Virgin opened the cape which covered her and spread it out before Blessed Dominic, to whom it seemed vast enough to cover the entire heaven and, under it, he saw a large multitude of the brethren. Then prostrating himself, Blessed Dominic gave thanks to God and to Blessed Mary His Mother. After that the vision disappeared and he returned to himself just as the bell rang for Matins. 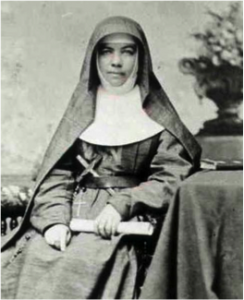 Australian Religious Sister, foundress of the Sisters of Saint Joseph. An excerpt from a letter written to her mother, Flora: from May 14th 1867, shortly after the founding of her new Congregation. Oh, I have long been sick and weary of the world and its cares, of its false pleasures and delights. Still, I could not wish to leave it as long as I thought God willed my stay in it. I have such an earnest longing for the Order of Saint Joseph and know well how hard it will be to get it established here, but everything God blesses will prosper, and surely His blessing attends this holy Order; none other is so fitted for the wants of this Colony… think, dear Mamma, of the work that is to be done, and how few there are to do it, and thank God for permitting a child of yours to be one, the least worthy, of the workers. If our work be so pleasing to Him, will He not console and bless you, dear Mamma, for having first lead me to love Him? From Mary MacKillop and Flora (2004), edited by Sheila McCreanor.